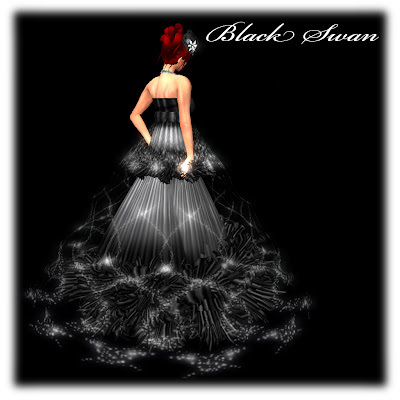 The Black Swan | ! *PurpleMoon Creations* ! 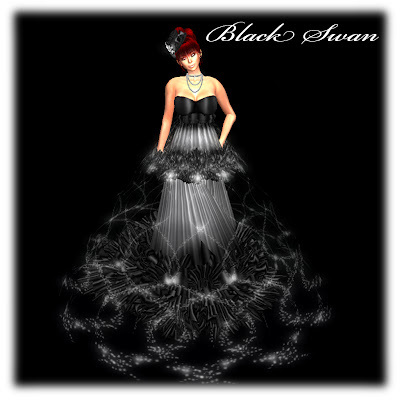 The term Black Swan comes from the 17th century European assumption that 'All swans are white'. In that context, a black swan was a symbol for something that was impossible or could not exist. The use of sculpted prims in this dress tries to reach the "impossible", sculpted and flexi prims combined to show that a nice gown could be done. This outfit comes with black striped royal silk ruffles that gracefully sweep along, ideal for a red carpet affair. The strapless empire gown with two rich rows of royal black silk ruffles. As a Hollywood star, a layer of glowing stars surround her, giving magic and mystery to this outfit. No need for the flash of cameras, brightness is already with her. Topped with a smart but fun hat and glowing prim eyelashes to complete the ensemble. This outfil will be sold only on request.